Texas Republican Sen. Ted Cruz had a chance to show off his often praised debating skills Friday in his first match-up against Democratic challenger Beto O’Rourke, the El Paso congressman running a competitive campaign against him. Cruz is trying to win a second term in the U.S. Senate in a race that the Cook Political Report on Friday rated a toss-up. New polls show the competition tightening with a Reuters-Ipsos poll on Wednesday giving O’Rourke a two-point lead in a typically reliable red state. Countering those indications is a Quinnipiac poll that had Cruz ahead by nine points. 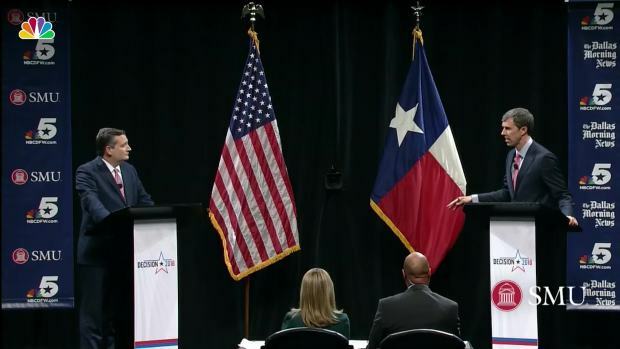 U.S. Rep. Beto O'Rourke and Sen. Ted Cruz faced each other in the first of three planned debates Friday in what has become a neck and neck race for the Texas senate seat. O’Rourke is a three-term congressman. He has raised more money than Cruz, a presidential hopeful in 2016 against now President Donald J. Trump, drawing national attention to the race. O’Rourke, who became an El Paso city councilman in 2005, is hoping to become the first Texan elected to the Senate since 1988. U.S. Sen. Ted Cruz (R-TX) and U.S. Rep. Beto O'Rourke (D-El Paso) address their views on the DREAM Act and a pathway to citizenship. The candidates address their views on the recent accusations made against Judge Brett Kavanaugh and how they should affect his confirmation hearing to the U.S. Supreme Court. A particularly sharp exchange between the two contenders came as they addressed police shootings of unarmed black men, one of which occurred about two weeks ago when a white off-duty Dallas police officer shot her black neighbor, Botham Jean, to death in his own apartment. Police Officer Amber Guyger, who has been charged with manslaughter, has told investigators that she mistook his apartment for hers. Cruz accused O’Rourke of calling police officers modern-day Jim Crow, a reference to local laws that enforced racial segregation in the South, and deemed the description offensive. “That is not Texas,” he concluded. Video of O’Rourke’s town hall on Wednesday at Prairie View A&M University, a historically black college in Prairie View, Texas, shows him talking about a system that he said suspects a person based solely on the color of their skin, that searches, stops or shoots someone based on the color of their skin. “It is why some have called this, and I think it is an apt description, the new Jim Crow,” he said. Cruz, when asked whether he thought the police shootings a problem, said that everyone’s rights should be protected, but blamed irresponsible and hateful rhetoric for shootings of police officers — among them the killing of five Dallas police officers in 2016. He accused O’Rourke of repeating things he knew were not true, including accusing white police officers of shooting unarmed African American children, and said that The Washington Post had fact checked the claim and found it to be untrue. “What did you not say?” Cruz asked. “I’m not going to repeat the slander and mischaracterization,” O’Rourke said. “You’re not going to say what you did say?” Cruz asked. “This is your trick in the trade, to confuse and to incite based on fear and not to speak the truth,” O’Rourke said. "This is a very serious issue." During the 2016 presidential campaign, Trump attacked Cruz viciously, suggesting that Cruz’s father had been involved in the assassination of President John Kennedy and tweeting an unflattering photograph of Cruz’s wife, Heidi, and threatening to “spill the beans” on her. How did Cruz, who later endorsed Trump and praised him, respond to critics who said he had lost his dignity? Cruz called his father his hero and his wife his best friend and the most beautiful woman on the planet. After the election, he faced a choice and decided to work with the president on cutting taxes and regulations and creating new jobs, he said. O’Rourke said that how Cruz responded when the president attacked him personally was his business. But the congressman also raised allegations that Trump had colluded with Russia to win the 2016 election and said he had attacked the country’s institutions. “We need a U.S. senator who will stand up to this president, “ O’Rourke said. The candidates addressed Sen. Ted Cruz's relationship with President Donald Trump and how it's evolved since the 2016 presidential campaign. 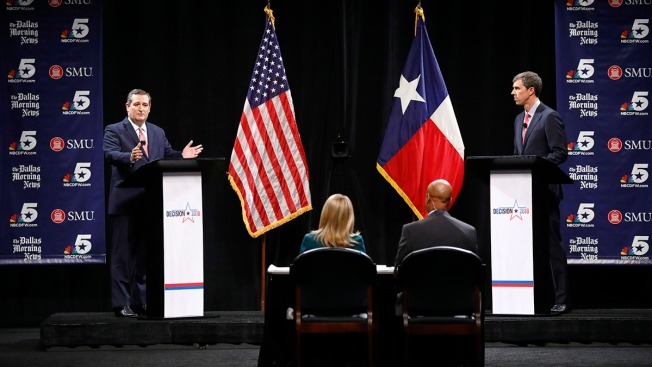 When the men were asked in the final moments of the debate what they admired about their opponent, O’Rourke said he knew how hard Cruz worked, the time he had spent away from his children and the sacrifices he had made. He said he had no question that despite their differences, Cruz wanted to do the best for America. “So I thank you Sen. Cruz for your public service,” O’Rourke said. Cruz agreed that the time away from their children was a sacrifice for both men and that O’Rourke was passionate, energetic and believed in what he was fighting for. Then Cruz compared O’Rourke to Vermont Sen. Bernie Sanders, who he said advocated socialism, higher taxes and expanding government. “You’re fighting for the principles you believe in and I respect that,” Cruz said. “True to form,” O’Rourke responded. The men clashed over how to protect students from shootings in school, both referring to the killings at Santa Fe High School in Santa Fe, Texas, in May. Cruz called for more armed police officers in school, and rejected any new gun control measures. O’Rourke argued that bringing a firearm into a classroom would not make students safer. On drugs, Cruz said that O’Rourke, while on the El Paso City Council, had called for a national debate on legalizing all narcotics, including heroin and cocaine. “There is consistent pattern when it comes to drug use that in almost every single instance Congressman O’Rourke supports more of it,” Cruz said. Cruz said that the issue was personal; his older sister died of a drug overdoes. O’Rourke, who was arrested for drunken driving in 1998, said that he wanted to end the war on drugs and to end the prohibition on marijuana. “To be clear, I don’t want to legalize heroin and cocaine and fentanyl,” he said. The candidates addressed drunk driving and marijuana laws.